We handle our own emergencies, so you can rely on us to provide your pet with continuous patient care 7 days a week, including holidays. 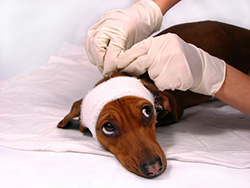 If your pet becomes sick or injured outside of our normal business hours, call us immediately. Our answering service will direct you to the after hours number of the veterinarian on call.